Spartak Moscow defender Leonid Mironov has been charged with racially abusing Liverpool striker Rhian Brewster, Uefa has announced. The alleged incident took place during a Uefa Youth League game at Prenton Park, which Liverpool won 2-0. England Under-17 international Brewster had to be calmed down by team-mates and staff at the end of Wednesday's match. The 17-year-old told the referee and the fourth official was informed, while Liverpool also complained to Uefa. European football's governing body said the case will be dealt with by their Control, Ethics and Disciplinary Body, with a date for the hearing yet to be confirmed. 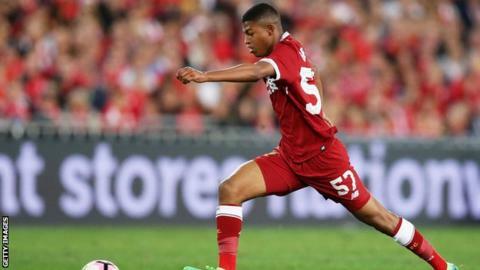 Brewster was a key part of the England squad that won the Under-17 World Cup in India in October, scoring a hat-trick in the semi-final against Brazil. Anti-racism campaign group Kick It Out said it was "appalled" by the allegation and called for Uefa to show it was "serious" about tackling racial abuse. "It is also extremely concerning to this organisation that yet another incident of racism has taken place involving a Russian club, particularly before the 2018 World Cup," the organisation added. Liverpool Under-19 coach Steven Gerrard told the Liverpool Echo: "It's difficult for me to comment on it right now. It's something that the club will look into and deal with. "I'd rather talk about Rhian Brewster's performance. I don't want to take any gloss off that because he was superb. The only thing that was missing from his performance was a goal." In September, Liverpool's Nigeria-born attacker Bobby Adekanye was subjected to racist chants and gestures from Spartak supporters in Moscow. European football's governing body Uefa charged Spartak, who had to partially close their academy stadium for their next Uefa Youth League fixture, leaving 500 seats empty.